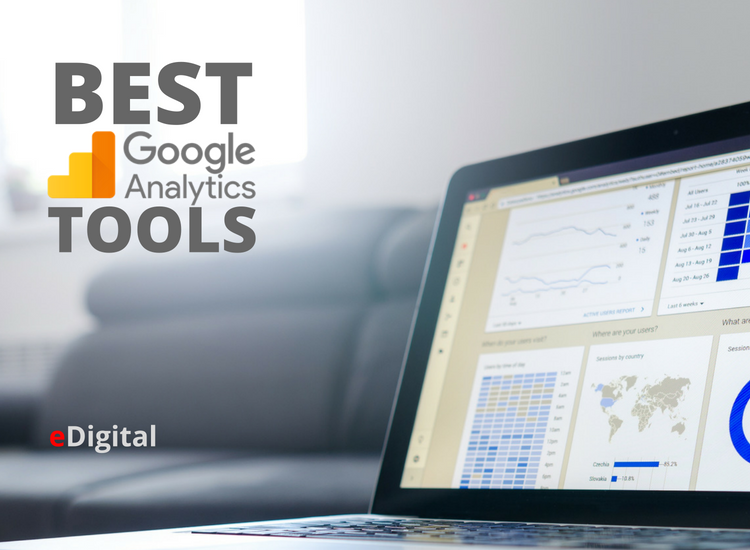 Find below the best Google Analytics Tools for 2018. Canvas extends the capabilities of individuals and teams by letting them perform efficient, accurate and reliable analysis. For standard and premium accounts, eliminate sampling, access and analyze multiple accounts at once, automate routine processes, update dashboards, write to databases and more. Built specifically for analysts and developers, Analytics Canvas eliminates manual tasks and enables analysts to drill deep into their data to extract powerful, actionable new insights. Whether your challenge is with sampling, handling large data sets, uploading cost data, blending in data from databases and files, writing to databases or working with multiple domains, Analytics Canvas has the solution for you and your team. Query and build your reports in a visual environment that lets you point and click, drag and drop your way to rich dashboards without coding to the API or writing SQL. Collaborate and share analysis within the company or agency, and easily document every step as you go. Our support staff are readily available to consult with you and your team to help you get the most out of the tool and out of Google Analytics. With way more power than a spreadsheet, once you try it you’ll want to conduct all of your reporting and analysis using Analytics Canvas. Import data from Bing Ads, Yahoo Gemini, Facebook Ads and Instagram Ads cost data into Google Analytics™ for as little as $9.95/month or $99.95/year for each service. The service will automatically import Bing and Amazon data into your Google Analytics account: Features: Easy one-time set up process, daily updates to your Google Analytics account, see Bing Ads, Yahoo Gemini, Facebook Ads and Instagram Ads cost data and ROI next to Google AdWords and other sources, use cost and ROI data to optimise and allocate advertising spend to the best-performing paid search traffic. Get data driven insights on calls to increase and document the profitability of your marketing department. Invest in channels that work and shut down campaigns that don’t.Our tool empowers you to have the marketing budget perform optimally and provide topline results by generating better leads. The insight provided by Bellmetric CallTracker enables you to prioritise all investments based on factual performance. By adding insights into caller behaviour, the number of total conversions – both offline and online reflect the true result of your campaigns. Features: Connect the sales funnel by documenting the ROI of marketing campaigns. Expand awareness and favorability by using our data on campaigns that perform. Optimise conversion rate by using our insights to improve your Call-to-Action. Increase sales while documenting the improvements. Integrate to Google Analytics and Adwords. Bellmetric CallTracker provides detailed insights on: Sources and campaigns that generate inbound calls. Expand and stretch your sales funnel by optimizing Adwords, display- and re-targeting campaigns to boost their performance. Also Increase conversion rate by looking at subsites and landing pages driving offline activity – combine with split-tests for perfect conversion. GOOGLE ANALYTICS EXCEL PLUGIN by Tatvic. This Excel plugin can extract data from Google Analytics & Adwords API into excel. Users can setup one time Dashboard with Tatvic & refresh it multiple times with different date ranges, views, accounts. There is a forever free plan for starters & for advanced users it starts at $29 a month. Automate Reports: Tatvic GA plugin offers feature to select input from a cell in excel sheet, on change of that input the resultant dataset changes.You can select dates, profile name, advance segment, filters via cell value Using this technique, you can configure a dashboard in excel & at later point of time update the dashboard by changing cell value. Powerful Dashboards: Tatvic Excel plug-in allows you to create powerful dashboards that can help you generate insights from your GA Data. Export More Data: With the Tatvic Excel Plugin you can now export more than 10,000 rows than available in UI of Google Analytics. You won’t have to spend time switching different profiles as all profiles are readily available. If you are in-charge of GA Data reporting, Tatvic GA-Excel Plug-in can save lot of your time by putting together a dashboard for your management and have it auto refresh at any given point in time. With Navegg´s audience targeting solution you can have your website’s audience segmented into 9 smart criteria, such as demographic data, interests, purchase intent and target each visitor with the best offers or content. Based on browsing behaviour in and out of your website we determine each user’s profile and allow you to target them individually with personalised content, offers or ads. Combining behavioral and profile data in Google Analytics allows you to understand what types of audience drive the most ROI for your site. By integrating Navegg’s criteria in your Google Analytics reports you can: Track demographics for specific visitor groups to better evaluate site usage; measure conversion rates in different segments to gain a better understanding of the conversion cycle; compare demographics over time, pages visited, sections visited and geographic region; help you understand your website audience and become much more relevant to your visitor, more attractive to advertisers and more profitable to you. 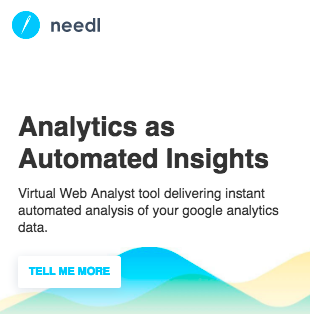 If you are using Google Analytics you should try Needl. This tool will save you stacks of time by automatically finding not only your best converting segments of data, but also those with poor bounce rate, weak converting and your highest impact. Needl delivers a prioritised easy to use ‘to-do-list’ of your top segments ranked against their potential to improve the goal you select or your eCommerce transactions /revenue. There is also some nifty ‘Smart Filters’ so you can just look at the segments you want, plus the ability to focus exclusively on Adwords, Paid or Referral traffic. Its easy to use and seconds to sign up and get going. You will need Goals set in GA or eCommerce tracking. helps you configure daily automatic cost data upload to Google Analytics. Check ROAS metric for each of your advertising campaigns in Google Analytics reports and increase their efficiency. How does the result look like: You will see cost, clicks, impressions and automatically calculated ROAS for non-Adwords campaigns in Cost Analysis report in Google Analytics. Where the imported data is stored: All imported data is stored in Google Analytics. You can change or limit access to it anytime. You don’t need developers to get started: To configure imports you just need to enable advertising services in Google Analytics. With Scitylana you can extract click-level and unsampled data from the free version of Google Analytics and load them into Power BI or Excel Power Pivot. This gives you more analytical options and allows you to integrate GA with other sources such as your CRM or ERP system. Moving your GA data to Power BI / Excel enables you to analyze data deeper and create beautiful dashboards. With access to the raw, unsampled data, you don’t have to worry about the message “This report is based on N sessions”. Instead, you can aggregate data in virtually any way you want using the complete data set in Power BI. Click-level data in Power BI allows you to enrich your GA data with other types of data. For example, if you have login or e-commerce on your website, you can store anonymous customer IDs in GA and use these as an integration key. Pulling data from your CRM or ERP system into Power BI allows you to explore how the most profitable customers and other segments behave on your website. Scitylana Free generates a data set with around 20 dimensions and 10 metrics from GA. With premium features you can update data automatically and add more variables such as events, goals, revenues, custom dimensions, etc. Set up an automatic daily cost data upload from Facebook Ads or Bing Ads into Google Analytics, or upload CSV files from any data source. You can then see the cost and ROI of all your advertising campaigns in GA. Simple interface makes it easy to set up a daily upload from Facebook Ads and Bing Ads. You can do it with just a few clicks! After the upload has been scheduled, it runs automatically without requiring any user interaction. You can set up multiple uploads from different Facebook Ads / Bing Ads accounts to different GA web properties. You can also upload of historical data going back several years. CSV files from any data source can also be uploaded.